In 1853, the first time a chess game was played using signals at sea between ships. 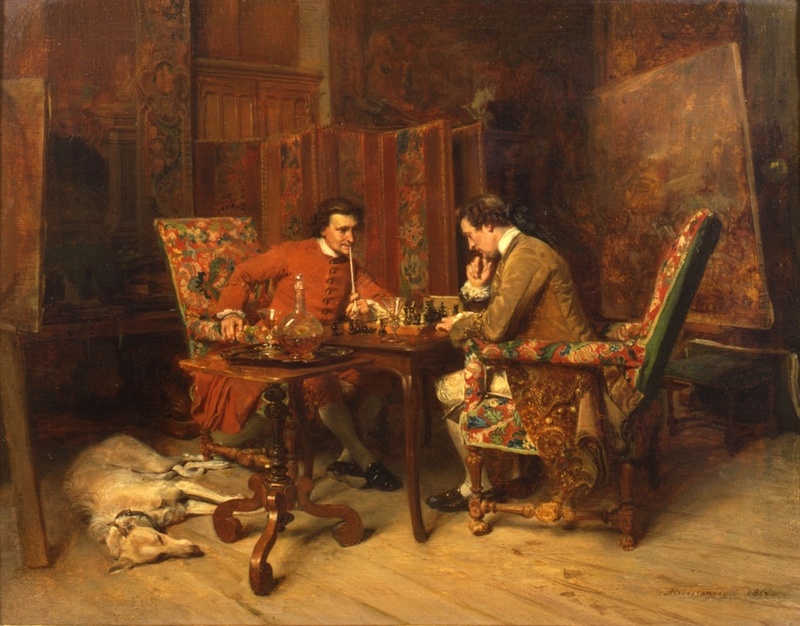 In 1853, Jean-Louis Ernest Meissonier (1815-1891) painted “The game of chess.” The painting is an example of the Realism style. In 1853, a chess club was formed at the Entwisle Hotel in Sydney, Australia. In 1853, a chess club was formed in St. Petersburg, Russia. In 1853 Howard Staunton travelled to Brussels to meet with Tassilo von der Lasa, the German leading chess authority, to standardize the rules of chess. Staunton lost a match to von der Lasa (4 wins, 5 losses, 3 draws). The match was supposed to last longer, but Staunton started having heart palpatations and returned to London. In 1853, Bernhard Fleissig was born in Hungary. He was a Hungarian-born Austrian chess master. In January 1853, the first unofficial Berlin Chess Championship was won by Jean Dufresne (1829-1893) followed by Max Lange (1832-1899) and Karl Mayet (1810-1868). There were 12 players in the event. In January 1853, Elijah Williams edited a chess column in The Field. From February through April 1853, an 8-player knockout tournament was held at the New York Chess Club. The winner was James Thompson (1804-1870). On April 8, 1853, Charles Vezin died at the age of 71. He was born in 1781. He was a chess master who lived in Philadelphia. On May 18, 1853, Lionel Kieseritzky died in Paris at the age of 47. He was committed to a mental home in Paris earlier. He was buried in a pauper's grave, its location has been found but not his exact plot. On July 1, 1853, the Bombay Chess Club was formed in Bombay, India. On August 2, 1853, John Edmund Hall was born in Bradford, England. He was a minor British chess master.